Having a baby is one of the most memorable and exciting life moments. For many people it’s one of the check-marks to life. Get married, check. Buy a house, check. Start a family, check. From the moment you find out you are pregnant all the way through delivery and beyond, it is all about documenting each and every moment. 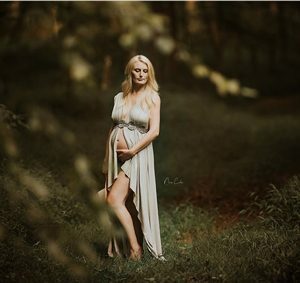 Getting professional maternity photos is a great way to capture these special memories for years to come. As time has gone on, photography sessions have gotten more and more creative. From the location down to your wardrobe there are many different ways to make your photos unique. A very common question asked about maternity photography, is when? When during my pregnancy should I have my photos taken? Shutterfly recommends having your session take place right around your 30-week mark. This allows for your belly to be nice, round and noticeable. Early on in the pregnancy you haven’t fully established your baby bump. However, as you get nearer to your due date the more uncomfortable you may become. Getting your photo taken in your last few weeks could cause discomfort to both you and the baby. You want to avoid getting pictures taken when your belly feels too heavy, usually after 35 weeks. If you are having multiples, your baby bump comes along a bit earlier. It is then recommended to get your photos taken around your 24-week mark. Another timing question is what time of day to have your session take place. Lighting can really change the overall picture by affecting the mood and depth of the photograph. It is commonly known amongst photographers that the “Golden Hours” are the best times to capture the best pictures. The Golden Hours are the few hours right after sunrise, and the few hours before sunset. During this time the lighting is more red and softer making for a dramatic photo. Alternatively, the Blue Hour causes low light with a cool undertone to it. The Blue Hour is directly before sunrise and after sunset, and only lasts for a few minutes so you have to be quick to capture your photos during this time. Any other time of the day you may have to get crafty with added lighting or locations to be able to capture the right mood for your session. Depending on what season you are pregnant during can determine the best spot for you to get your photos taken at. Having an at home session is always an option no matter the time of year. Being at home allows for some added comfort. You are after all in your usual space surrounded by your own everyday life. A fun idea is to get maternity pictures taken inside of the nursery you have been nesting in. Then to have a follow up session in the nursery after your baby is born can make for a great album. Many photographers offer in studio sessions as well. This is also a year-round option. No matter the weather, you can have your session completed indoors. Some studios will have access to some great props, wardrobes and accessories to add a special touch to your photos. Spring – April showers bring May flowers and Springtime is the time of budding new life. Apple orchards are a beautiful option bursting to life with their blossoming trees. Spring flower blooms add an extra splash of color to your photos. As the snowcaps begin to melt, creeks and waterfalls become full of life again and now would be a great time to include them in your photos. If you are near mountains a great contrasting photo would be to have the snow capped mountains in the background while standing in a field of freshly bloomed flowers below. Summer – During the Summer season the daylight lasts longer than other seasons. With the great weather this opens up many locations you can pick from for your photo session. The family cabin, the beach and carnivals are all fun and unique options. Also, a Summer storm can cause for a dramatic photo. Especially if your photographer is able to snap a lightning shot. Nighttime photography is also an option with the warm weather. With the right equipment and lighting you could capture some very beautiful and starry photos. Fall – Just like Spring, Fall is full of bursting colors, just found in different places. The changing of the trees provides warm and vivid colors helping add extra dynamics to your photos. There is also less hours of harsh midday sunlight, allowing you to have more time to capture warm and soft toned pictures. Apple orchards, corn mazes, and pumpkin patches are fun locations to have your maternity photography session. With all the different colors and added props for you to use, you could really create a unique photo shoot. Winter – Winter can be a complicated season to have a maternity photography session. With the cold and oftentimes harsh weather conditions, it can be difficult to find the right location and time for your photo shoot. However, don’t be discouraged, you can still have a special session you just have to get a bit creative. Nearby woods can add great contrast between the trees and the snow. Winter time is also the time to really have fun with your wardrobe. Bright colors and added accessories put a nice touch to your photos. Deciding what to wear for your maternity photography session can be quite frustrating. Especially during this time where your usual go to clothes no longer fit. It’s recommended to not wear any tight fitting clothes before your photo shoot to reduce the chances of marks and redness on your glowing maternal skin. Make sure your baby bump is nice and moisturized for those bare belly shots! Try to avoid busy patterns that could potentially conflict with your surroundings. In fact, a solid colored maternity gown is a great look for your photo session. If your photo shoot is taking place inside, a nice cream or bone colored gown can add simplicity to your look without being too distracting. While being in an outside location, bright jewel tone colors are preferred. This helps draw attention from the complex background to the beautiful mother. Mixing different belts, flowers, and accessories with your gown helps add a customized touch to your look. Overall, what really matters is that you as the mother are comfortable and satisfied. Work with your photographer ahead of time to create a concept for your photo session that pleases you. 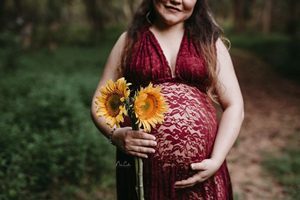 Your photographer can help give advice on when, where and how to help you feel the most beautiful during your maternity photo session. To capture these special moments, contact us here.